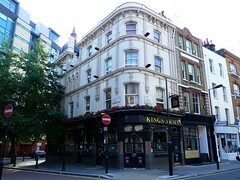 A good, traditional pub in an area of Fitzrovia dominated by rather more soulless places. It's been retouched a bit since the smoking ban, to good effect. It still gets crowded after work on some evenings, attracting office workers and the occasional drinker from the nearby BBC Broadcasting House, and when it does it can be very hard to get past the bar, but most of the time it's not a problem finding a seat. There's a bare-floored seating area to the rear of the pub (near the Wells Street end), which has a bit more space, and offers some large leather chairs for relaxing in but can seem a bit cold, though it can be reserved for groups. The front of the pub is carpeted, with comfy banquettes around the edge, and a few tables. There's only sporadic music (from the jukebox), but not too loud. There are four handpumps for ale, one of them not apparently in use. On a September 2008 visit, they had Young's ordinary and Black Sheep Bitter, as well as Jenning's Cumberland Ale. The third is apparently a guest ale, as the first two ales were the same in November 2009, but with the addition of Deuchars IPA. In October 2011, the ales were Deuchars IPA and Black Sheep Bitter (£3.50/pint). They also have standard lagers, including Staropramen and Beck's Vier. A good range of snacks are available. Ewan's verdict: A pleasant pub, relatively relaxed clientele, and usually fine for getting a seat. Last visited by Ewan, Kake, Sarah and others, October 2011. Last edited 2011-10-27 16:23:34 (version 9; diff). List all versions. Page last edited 2011-10-27 16:23:34 (version 9).